This article is about the characters from Mario & Luigi: Paper Jam. For the Toads that appear in the Paper Mario series, see Toad (species) § Paper Mario series. For the character Toad as seen in the Paper Mario series, see Toad § Paper Mario series. Paper Toads are paper incarnations of Toads that appear in Mario & Luigi: Paper Jam, who came out through a magical book. They interact with both the real world and the paper world. 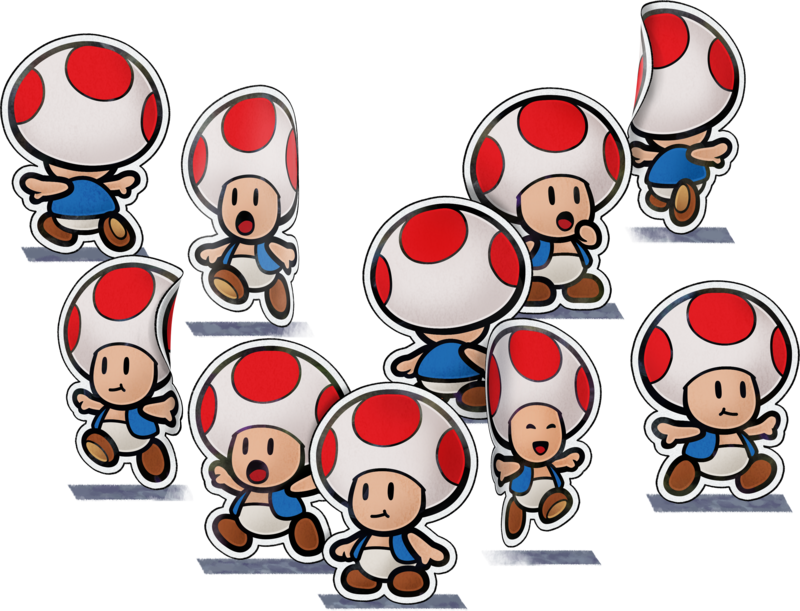 Toads are depicted as Paper Toads in the Paper Mario series. They are often extremely afraid of the real world and often hide in areas throughout the Mushroom Kingdom, requiring Mario, Luigi and Paper Mario to find them on missions that the player can initiate through the Lakitu Info Center. These missions are often requested by Toadette, due to her requiring Paper Toads in order to build Papercrafts. After enough Toads are saved, the trio are sometimes rewarded with a Trio Attack. As the story progresses, many Paper Toads befriended their real-life counterparts. They also have a critical part in the story as being the "Toad Stairs" that take the trio from Mount Brrr to Neo Bowser Castle. This page was last edited on January 22, 2018, at 12:26.